We are always curious how members find our website. 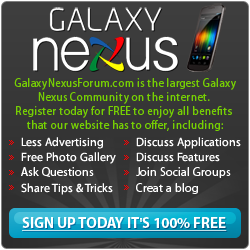 So, we'd like to ask you how you found GalaxyNexusForum.com. Mujibar, bkdodger, laineyc and 1 others like this. The little Android in my head told me. Can't wait for this one to drop. Maybe ill finally cast my vote on stick with it! I went to check on Muji and wound up here. Oh well, glad to be here everyone. Glad you're here, old man! From Wicked of course. I didn't know there was any other way.